It’s been said by many that Guante is the perfect 21st Century Man. 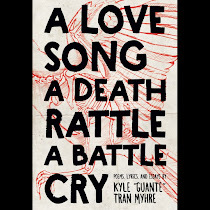 Indeed, as inarguably the best MC of his (or any) generation, a two-time National Poetry Slam champion, perfect physical specimen, hilarious Twitter personality, brilliant writer and masterful orator, Guante’s only real flaw is his flawlessness. An artist is supposed to create art that the common people can relate to in some way, to reveal the universal truths that connect us all. How can someone as inhumanly luminous as Guante make music that the rest of us can even comprehend, let alone relate to? Amazingly, unexpectedly, beautifully, he’s done it. I’m still processing how it was possible, but he’s done it. This new album, “An Unwelcome Guest,” (buy it at this link or continue leading an empty life) a collaboration with super-producer Big Cats! (the exclamation point is absolutely necessary), is nothing short of an instant classic, a superlative masterpiece that ties together every thread and impulse that defines our existence in a way that is as familiar as it is revelatory, as challenging as it is compelling and as ugly as it is beautiful. This isn’t just the best hip hop album of the past decade—it’s one of the most inspiring works of art ever created by humanity. A concept album, “An Unwelcome Guest” tells the gripping story of an unnamed narrator traveling from East to West in the wake of an unspecified (though likely zombie-related) disaster of apocalyptic proportions. Through this narrative frame, Guante weaves together a story that touches on illegal immigration, violence as a tool of social change, the mythology of superheroes, authority and rebellion and love and much more. The songs are dark without venturing into melodrama, political without being preachy or overbearing, and catchy without being saccharine pop nonsense. Every word of every bar counts. Sometimes, a single line will allude to multiple ideas; sometimes, a single word or syllable will wrap itself around a complex philosophical concept in a way that will open your mind to the majesty of existence. A hundred years from now, English Ph.D students will be writing papers about this album. A thousand years from now, monks will furiously scribble its lyrics onto parchment as alien deathrays rain down destruction around them. Big Cats!’s beats are relentless, multilayered hip hop symphonies, easy to lose yourself in, impossible to take in with just one listen. 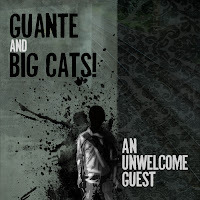 The give-and-take, call-and-response dynamic between the two members of this duo is nothing short of hypnotic—you’re absolutely enveloped in Big Cats!’s music, and Guante’s vocals are your lifeline, the only way out of the darkness… so you listen as though your life depended on it. Maybe it does. Listening to—nay, experiencing—this album is like waking up with functional wings, like watching a million rainbow-striped, machete-waving koala bears dancing through your dreams, like God Himself has just destroyed the rest of the world so He can focus entirely on you. What more can I say here? I’m not nearly talented enough as a writer to express the total ecstasy that is listening to “An Unwelcome Guest.” My favorite song is every song. My favorite line is every line. This will actually be my last review for this publication. I’ve handed in my resignation; this album has inspired me to actually do something real with my life. Thank you, Guante & Big Cats!. Thank you.